Ask any business with an online presence what their business objectives are and lead generation is sure to appear somewhere on the list – usually near the top for B2B businesses and those selling high-ticket items because their potential customers require more nurturing to convert. Whatever the nature of your business is, with Google announcing its rebranding of AdWords to make it more user-friendly, now is the perfect time to learn how you can use paid search for lead generation when looking to attract new business. To get you started, we’ve broken down how you can use 5 different platforms to generate high-quality leads for your business. Officially known as Google Ads from 24 July, Google AdWords is the top dog of paid search and has been for quite some time now. When a business starts exploring PPC options, AdWords is where they’ll start. With a majority of users not being able to distinguish Google’s ads from organic search results, it remains one of the best ways to drive new business through your lead generation methods. The reason why AdWords works so well for lead generation is that it allows you to target users at the exact moment they are searching for something. Reaching a user this early on in the conversion funnel allows you to then nurture them into a customer through display advertising and remarketing further down the line. A key thing to keep in mind is to not forget about optimising your AdWords campaigns for mobile – thanks to Google’s ‘click to call’ feature you can now add a phone number to your ad copy, encouraging users to contact you directly. Display advertising is where you can start getting more creative with your lead generation efforts. Available in a range of formats including, image, video, flash, and audio, display marketing offers a more budget-friendly alternative because you aren’t bidding on specific keywords. More experienced users can take advantage of the platform by using a layered targeting approach and setting custom affinity audiences, while display advertising novices can make use of Google Display Network’s “Smart Display” function. The highly-automated nature of smart display campaigns allows you to set up a campaign with automated bids, targeting, and creatives, to maximise your lead generation efforts. If you’re a new business or find that the search volume for your products isn’t high enough to warrant an AdWords campaign, display advertising can help you generate leads by targeting relevant users as they browse certain websites or by serving them ads after they watch specific videos. Ideally, if your budget permits, you would be using a mix of paid search techniques for lead generation purposes, but display advertising is a good place to start and works especially well if you can identify where your potential customers are likely to be found online. Google Shopping might not be the first platform that comes to mind when you think of a lead generation campaign utilising paid search, but if you’re savvy you can use it to generate some high-quality leads. 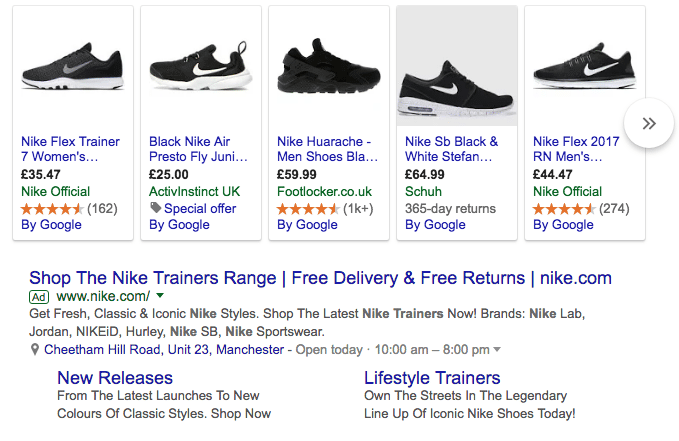 With Google Shopping, you can include product images in your ad and they are usually displayed higher up in SERPs, increasing the likelihood of a user clicking on your advert and putting your products in front of customers from when they begin their search. Although the primary aim of using Google Shopping is to generate sales, even if a user clicks on your advert but doesn’t make a purchase, you can use the data to inform your remarketing efforts…which nicely brings us onto our next way to generate leads. It’s all well and good generating leads, but for them to have any value for your business, they need to be high-quality leads that will eventually turn into a purchase. By using remarketing, you can target users that have already visited your website and customise your ads more efficiently based on their browsing habits. When you’re using remarketing to fuel your lead generation efforts, it’s important that you offer users something of value, rather than trying to sell them something. By focusing your remarketing on a content offer, you will generate leads that are more likely to be interested in what your business has to offer and make a purchase in the future. Let’s be honest, remarketing is basically cyberstalking – which is why it’s a good idea to add a frequency cap to your campaign if you’re going to use it for lead generation. You don’t want to drive users away by serving them the same ad 20 times a day so make sure you set an appropriate frequency cap. There’s no rule of thumb when it comes to frequency caps so we recommend looking at your historical ad frequency data to determine what the optimal cap will be for you. To ensure that your remarketing efforts are generating high-quality leads, make sure that you segment your audience in order to filter out junk leads (users who aren’t likely to ever be interested in the service or product you’re selling). Your remarketing ads should always tie back to the experience the user had with your website or the product they were interested in, in order to nurture them as a lead. Targeted landing pages are an excellent way of generating leads, especially when combined with display advertising and remarketing. The first step to creating a landing page that will help you successfully generate leads is to establish what action you want users to take. Common call-to-actions for lead generation include newsletter signups, registration forms, free trials, and contact forms. Your CTA will be determined by the action you’re aiming to trigger and the information you’re looking to gather from users. A well-designed landing page will also support your other paid search lead generation efforts, as lengthy forms and a lack of trust are often the reason why users don’t take an action once they land on a page. As Google Premier Partners, we’re experts in creating paid strategies that will support your business goals, fuel lead generation, and help you maximise your digital marketing efforts. To find out how we can help your business, take a look at our range of PPC services or get in touch with us today.